We’ve been contacted by Christine Moore, who is a distant cousin of Sarah Deacon. She has provided much new information! They can be found at the bottom of this page. Sarah Deacon, a resident of Hills End, committed suicide by throwing herself into the “moat” of the rectory on Christmas Day, 1836. She was in despair at her poverty. The affair was raised in the House of Commons on 27 Jun 1842 by John Fielden, MP for Oldham, during a debate on a revised poor law. Fielden used it as an example of the law’s inhumanity. Fielden’s life is documented here and here. Here is Fielden’s speech from Hansard. He misquotes her name as Susan. All other sources suggest she was Sarah. As to the humanity of the law, he would give one fact, and he begged to be understood as giving one fact of many that he could produce. We, the undersigned jurymen on the body of Mrs. Deacon, of Hill’s-end, Eversholt, who drowned herself in the Rev. J. Reed’s moat, on last Monday morning, through distress of mind, in consequence of having been refused a shilling per week by the said J. Reed and the other guardians of the poor for Eversholt parish, have given our verdict “Insane;” and, out of compassion and respect to the deceased, in order to prevent her goods from being taken from her orphans to defray the funeral expenses, have contributed 6d. each towards burying her. The smallest contribution from any person who can feel for such a case, will be most thankfully received by the jurymen. Should there be more collected than will pay her funeral expenses, it will be given to her poor children. He had offered to prove this case before the Poor-law committee, but was frustrated. Mr. Bull had attempted to get it before a committee of the Lords, but he had also been frustrated. The paper, however, circulated by the jurymen, spoke for itself; and he adduced that one case as a specimen of the humanity of the new law. There is no monument to Sarah Deacon in the churchyard now. The chair of Woburn Guardians, Theed Pearse, was Clerk of the Peace for Bedfordshire, and approved Ambrose Reddall’s expenses as coroner! so costs were cut by a factor of three. Unfortunately, that meant that benefits to poor people were also cut by a factor of three. This event was commented on in many newspapers, some copying articles from others. Fielden, who seems to have been quite a firebrand, wrote on it several times. ” ‘We, the undersigned,Jurymen on the body of Mrs. Deacon, of Hill’s End, Eversholt, who drowned herself in the Rev. J. Reed’s moat, on last Monday morning, through distress of mind, in consequence of having been refused a shilling per week by the said J. Reed and the other Guardians of the Poor for Eversholt parish, have given our verdict, ‘Insane;’ and, out of compassion and respect to the deceased, in order to prevent her goods from being taken from her orphans to defray the funeral expenses, have contributed sixpence each towards burying her. The smallest contribution, from any person who can feel for such a case, will be most thankfully received by the Jurymen. Should there be more collected than will pay her funeral expenses, it will be given to her poor children’ “. Of the inquest at Eversholt, of which you requested me to give you some information, I wish merely to state that the Coroner is a lawyer; that he resides at Woburn, and that he is Auditor of the Woburn Union. I wish to say no more, than that the Coroner is not remarkable for the suaviter in modo, however much he may possess the fortiter in re. But he is a rich man, and I pay him great respect, as all rich men naturally and rightly expect. They were born to receive, the homage of the swinish multitude, and in England I think they receive it to their heart’s full content. For if Englishmen are more prone to one sin than another, it is their excessive respect of wealth, independently of any virtue or talent in the posessor to justify their preference. “Suaviter in modo, fortiter in re” means “gentle in manner, resolute in execution” as is explained here. So the text is saying that the coroner is not gentle in manner. Fielden addressed a rowdy meeting at Todmorden, reported in The Champion and Weekly Herald for 27 Feb 1837. I (EJW) am not sure quite what this has to do with the affair. The Champion and Weekly Herald for 16 April 1837 reported on an “Aggregate meeting of the trades of manchester in opposition to the poor law amendment bill”. James Cobbett, apparently the son of a more famous Cobbett who had died, spoke. He perhaps overegged his argument with a dollop of the tumbrils, but there’s no denying his passion. The phrase “leviathan of church plunder” is used to describe the Russell family again in The Champion and Weekly Herald of 17 July 1837, but I’ve been unable to find the original quote by Burke. “Lord John” Russell seems to refer to the younger son of John, the 6th Duke of Bedford. From his wikipedia entry, Lord John does seem to have been slightly to the left of the centre views of the day, meaning his views were about as liberal as those of, say, Norman Tebbit. In particular, Lord John would later be prime minister during the great Irish famine, which his government spectacularly failed to alleviate. The biblical quote Cobbett uses above is astonishingly appropriate. It’s Isaiah 10:1, which records what are supposed to be the writings of a man who could foretell the future, sometime around 700BCE. The subject of his tirade is taken to be the rulers of Judah, next door to and long-term rival of Israel. Judah eventually fell in a shockingly bloody war, boosting Isaiah’s reputation as a seer. Whatever translation one likes, the meaning is specific: Isaiah is cursing those in power who make laws to impoverish the poor, and, specifically, take money from widows. The rector should definitely have been familiar with the text. Aha! James Cobbett was presumably the son of William Cobbett, famous terror of the establishment and anti-poor-law polemicist. William died in 1835, and had been MP for Oldham. then, when William died, John Fielden took over the Oldham seat. That’s how it all fits together. The Morning Chronicle of 11 July 1837 published this table, without comment. It’s approximately reproduced here as a spreadsheet. How did people add up before spreadsheets? The spreadsheet can be opened directly here. The item from the Farmer’s Magazine above was probably copied from this table.
. Table, showing the average expenditure of the three years ending Lady-day, 1834; the expenditure of the three years ending Lady-day, 1837; the average of the same, and the saving per cent.
. Parishes Average expenditure of three years ending Lady-day 1834. Expenditure for the years ending Lady-day, Average expenditure of three years ending Lady-day, 1837 Average saving, per cent. The report on the inquest was printed as a House of Lords “printed paper”, number 189, on 8th June 1838. That paper does’t seem to be online, but there is a summary of it reproduced in The Mirror of Parliament edited by J H Barrow. The summary strips the affair of any emotion whatsoever. The report may have been reproduced in Volume XVIII of the Sessional papers of the House of Lords on page 213, according to this reference. Again, the actual paper is not online. This was triggered by a motion in the Lords from Lord Wharncliffe on 1 june 1838, reported here. Wharncliffe was very left-wing by the standards of the day. On the motion of LORD WHARNCLIFFE, ordered to be laid before the House—copy of the depositions taken by J. 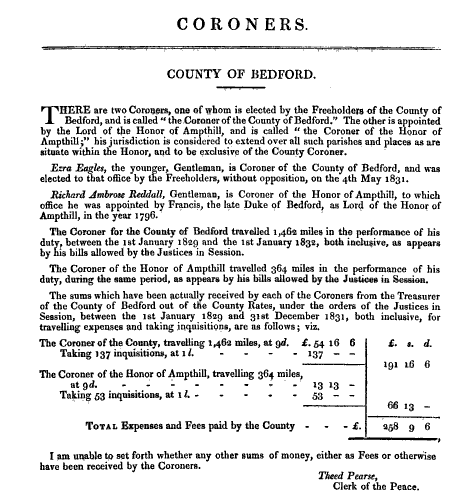 A. Riddall, Esquire, coroner for the county of Bedford, upon an inquest held upon the body of Sarah Deacon, in the month of December, 1836; together with a copy of the verdict of the jury. which was soon acted upon, reported here. The Lord Chancellor informed the House, that the Clerk Assistant had received by post, from Richard Ambrose Reddall, Esquire, coroner for the county of Bedford, a copy of the inquisition held upon the body of Sarah Deacon, in the month of December, 1836, together with a copy of the verdict (the depositions not having been taken in writing), pursuant to order of Friday last. — The same was ordered to be printed, and referred to the Select Committee on Poor Laws. Fielden wrote a confrontational letter to the Guardians (the committee that handed out poor-law cash) of Todmorden in The Morning Chronicle of 11 July 1838, which is only relevant in that it began a correspondence which ended in the letters reproduced here. Fielden wrote again to the Todmorden guardians, and the letter is printed in The Northern Star and Leeds General Advertiser for July 21 1838, and also The London Dispatch and People’s Political and Social Reformer of 29 July 1838, but unfortunately that text is missing here. It’s that letter that so upset Pearse, below. The Champion and Weekly Herald of 12 August 1838 reprinted letters to and from Fielden. The letter to Fielden from Pearse of the Woburn Union takes offence at a letter from Fielden to the Todmorden guardians dated 16 July 1838. The 16 July letter is missing from this collection – more soon! Here’s the Pearse letter. The italics are from the text in the Champion. To the Editor of the Morning Herald. Allow me to say that Mr. Fielden is well aware that the only reason why the case of the widow Deacon was not gone into by the committee of the House of Commons was because the committee of the House of Lords had taken it up. Under these circumstances, is it not most unfair, most unjust towards the Woburn Board of Guardians, on the part of Mr. Fielden, publicly to prejudge the case, and to impute harsh treatment to the guardians to the degree of driving the widow Deacon to self-destruction? Whenever the facts of the case are brought under investigation, I confidently rely upon its being proved that the distressing suicide which occurred in the parish of Eversholt (and not of Woburn, as stated by Mr. Fielden) was not the consequence either of destitution or of any harsh treatment on the part of the board. In justice to myself and colleagues I hope you will afford this statement a place in an early number of your journal. Chairman of the Board of Guardians of the Woburn Union. Harlington, near Ampthill, July 30. Fielden wrote a devastating reply, printed in the same issue of the Champion and Weekly Herald, and also in The Morning Chronicle of 6 August 1838. MR. FIELDEN AND MR. PEARSE. Sir—In your paper of the 2d instant I find a letter from Mr. Pearse, chairman of the Woburn board of guardians, complaining that, in a letter addressed by me to the Todmorden board of guardians, I have dealt “most unfairly and most unjustly” by the board of which he is the chairman in stating the following:—”Mr. Pearse, chairman of the board of guardians of Woburn, was thus protected, when I would have inquired into the case of the widow Deacon, of Woburn, whose relief had been gradually withdrawn, and who, in despair, from the harsh treatment of the guardians, drowned herself in the moat of the clergyman, under the walls of Woburn Abbey.” Mr. Pearse does not explain to you what protection it was that I complain of, and, therefore, I will do that first. I related to the Todmorden guardians that when he (Mr. Pearse) was brought to be examined before the poor-law committee, and was giving his evidence in favour of the working of the act, he was protected from answering a question put to him by me to illustrate the treatment of poor widows, and which, in my opinion, would have drawn a gloomy and adverse picture before the eyes of the committee out of this gentleman’s own mouth. I was stopped in a manner so remarkable, and with so much promptness, as to make a great impression on my mind; but a short quotation from the 37th, 38th, and 39th report (these forming one report) will put you in possession of the course of examination that I was pursuing, and the manner in which I was frustrated. ” Question 13,127. Mr. Fielden: I find that an address to the poor-law commissioners from the Woburn union was sent up in the year 1836, and in that address there is this passage: ‘To aged widows and labourers of good report, struggling under the pressure of declining years, it is the practice of the board to administer the provisions of the act with much kindness, indeed, with the utmost latitude that a proper interpretation of the regulations of the commissioners referring to this subject will admit;’ has that practice been pursued towards those widows, or to widows residing on the spot?—I hope that it has. ” 13,128. You, a chairman of the board, ought to know whether it has or has not ?—There may be a difference of opinion upon the subject; we think that we have administered the law with kindness. ” 13,129. You are so conscious of it that you sent up this report to the Poor-law Commissioners?—That was the report of the board, and implied the conviction of the board at the time. ” 13,130. Do you remember the case of a widow in Woburn of the name of Mrs. Deacon? ” The committee-room was cleared. ” An objection being raised to the question, motion made [Mr. Fielden], that the witness answer the question. ” Question put, ‘That the words proposed to be left out stand part of the question :’ ” Ayes 1, Mr. Fielden; Noes 3, Mr. Freshfleld, Mr. Liddell, Mr. P. Scrope. And thus the question was got rid of for that day, on the amendment of Mr. Scrope. This remarkable disinclination to hear the case of the widow Deacon out of the mouth of the chairman of the Woburn board, he being already sitting in the witness’s chair before us, struck me as singular; because, if it was a case of a distressing kind (and Mr. Pearse confesses it was), and if it was one on which there had been, or was likely to be, misrepresentation, surely here was an opportunity that Mr. Pearse, as chairman of the board, would have sought for, in order that he might give the explanation that would refute all misrepresentations past, and anticipate any that might come. But Mr. Pearse accounts for the postponement In this manner: “Allow me to say that Mr. Fielden is well aware that the only reason why the case of the widow Deacon was not gone into by the committee of the House of Commons was because the committee of the House of Lords had taken it up.” Now, sir, so far is it from being a fact that I was well aware that the Lords’ committee had taken this case up, that I had it from the mouth of the Reverend Mr. Bull that the Lords positively refused to let him enter upon the case after they had called him before them to substantiate cases that he had alluded to at public meetings, and after he had taken the pains to go to Woburn and Eversholt to make personal inquiry into the case of the widow Deacon, that being one that he had mentioned either in speeches or writings addressed to the people in the north. Indeed, to say that the Commons’ committee declined going into the case of Mrs. Deacon for no other reason than that the Lords had taken it up, is to accuse the committee of gross inconsistency; for when Mr. Bull was before the Commons’ committee, he wished to be excused from answering questions there as to the cases he had mentioned, alleging that he was to be examined before the the Lords on those specific cases; that a noble lord had, to his knowledge, announced his intention in the house to move for a committee before which Mr. Bull should be examined; but this was considered by the Commons’ committee no reason for allowing Mr. Bull to reserve his answers, and he was pressed till he did answer all that the committee had to ask of him. On a subsequent day to that on which Mr. Pearse was thus protected, I again pressed the Commons’ committee to make the inquiry; but I was assured that Lord Wharncliffe had sent for Mr. Pearse, and had stated that the Lords’ committee would investigate the case. I acquiesced in then deferring the inquiry, expecting the Commons’ committee to go into it if the Lords did not. I have repeatedly made inquiry since, whether the Lords were investigating the matter, but have never yet heard any satisfactory answer; and, indeed, we have in the 5th paragraph of Mr. Pearse’s own letter the proof that their lordships have not even yet “taken up the case;” for he begins that paragraph thus :— ” Whenever the facts of the case are brought under investigation,” &c. So that on the 30th of July (the date of Mr. Pearse’s letter) the Lords had not begun the investigation, though on the 1st of June he was stopped from answering my question only,” he tells us, “because the Lords had taken up the case themselves”! ” Under the old poor-law this widow, who had been left nine years before with four children, received out-door relief (I think the amount was five shillings weekly). Under the new law it was gradually withdrawn, and finally discontinued altogether in September, 1836. ” At the time of her decease her two girls were at service, and she had her two boys living with her—one eighteen years of age, who worked for the Duke of Bedford, and had six shillings a week (it had been recently raised from five shillings to six shillings a week); the younger boy had two shillings and sixpence a week. The elder boy paid his mother four shillings a week for his board and lodging, requiring the other two shillings for shoes and clothing; so that the three persons had for their subsistence, when the rent was paid (1s. 6d. a week), something less than threepence per head per day, to include fuel and clothing for two persons. When her outdoor relief was entirely discontinued In September 1836, she was offered the workhouse. This offer was very grievous to Mrs. Deacon, who begged very earnestly to be allowed but one shilling a week. She had seen better days, having been the wife of a small farmer, and had been respectably brought up. ” Some time before Michaelmas 1836, she paid her last visit to the board of guardians at Woburn, and, after waiting three or four hours at the workhouse, she was told by Mr. Stratfold, the then relieving-officer, now at Woburn, that she was not to have any relief at all except in the workhouse. She begged to speak with the gentlemen (the guardians), but was told that she could not see them. She came home in a very depressed state of mind, and the effect upon her health, at that time not good, was evident. From being, as Mr. Fleet stated, in her younger days the finest woman in the village, she became from distress of mind (and William Chapman believed, want of sufficient food) most pitiable in her appearance. ” From the straitness of her income she began to incur debts which she saw no prospect of paying, and this, together with the ultimate and apparently inevitable necessity of accepting the offer of the workhouse, was a source of constant grief to her, and the subject of her frequent complaint to her neighbours. It was stated that she made her appeal to the local guardians without effect. Mrs. Meltham being on a visit to her daughter, the wife of William Brown, slept several nights with Mrs. Deacon, who usually was glad of her company, and she endeavoured to cheer up her despondency. Though generally distressed in her mind, she became much worse towards Christmas, and on the night of Christmas-day, 1836, was in a very pitiable state, pacing up and down the house, striking her hands together, and talking of her children being ruined or coming to want. Mrs. Meltham had difficulty in persuading her to go to bed, which at last she did, but lay awake uttering many exclamations of distress. That night Mrs. Meltham said she (Mrs. Deacon) seemed to treat her as if she was in her way, though, before she had always been so glad of her company. Mrs. Deacon soon left her bed, and walked about the room striking her hands and uttering distressing exclamations, and Mrs. Meltham being alarmed at her disordered state, knocked up at the partition wall, her son-in-law Brown, and called Mrs. Deacon’s son to get up, which he began to do as soon as she could awake him. ” About this time she saw Mrs. Deacon throw herself into a chair, and clapping her hands violently over her head, she exclaimed, ‘The Lord forgive me!’ Mrs. D. then went down stairs, and suddenly darted out of the door. Mrs. Meltham hastened the son to follow his mother, which he did, and as soon as he was gone she put on some of her clothes and her cloak, and went out to alarm the neighbours. It was a bitter night, the ground was covered with snow. The son soon returned in great dread, stating that he had tracked his mother through the snow to the moat of the rector, the Rev. James Reed (about 300 yards distant, as nearly as I could guess), and that she had thrown herself in. Chapman, Brown, and Pepper, then went down with others and pulled the corpse from the moat. The clergyman’s family were roused, and Mr. Reed sent them word to have the body rubbed and a surgeon sent for, which was done as soon as they had borne the corpse home upon a door taken from the clergyman’s premises. The moat, which I saw, borders upon the rectorv garden, and has a little gate opening into it from the road. It was also stated that the moat was thinly frozen when Mrs. Deacon plunged in, and that <unreadable> of the frost, the shape of the body and her head were very distinguishable so as to excite the attention of passengers. ” An inquest was held on the body, and the jury agreed on a verdict to the effect (the words were not precisely given) that Mrs. Deacon was insane and had drowned herself in Mr. Reed’s moat, on last Monday morning (about two o’clock), through distress of mind in consequence of having been refused relief by the guardians. The coroner. Mr. Reddall, of Woburn, and the auditor of the union, objected (as Mr. Fleet stated) to the verdict, saying, that the proper verdict was ‘ insanity,’ and that the rest was only the opinion of the jury. ” The jurymen afterwards commenced a subscription out of compassion and respect to the deceased, and in order to prevent her goods being taken from her orphans, if the union should be put to any expense for her funeral, and the money so collected, amounting to upwards of ten pounds, was to be spent in paying her funeral expenses, in discharging her debts, and the rest to be given to her children. The subscription paper contained a heading to the above effect: Lady Charles Russell, Colonel Seymour, and the servants of the establishment at Woburn Abbey, with many respectable persons around, contributed handsomely. ” My time was very limited, being ordered to be in attendance at noon on Monday before the committee of the House of Lords. I conceive, however, that I have obtained sufficient information to enable their lordships to enter upon an investigation of this case, which I cannot learn has ever been inquired into by the poor-law commissioners. I subjoin a list of the names of parties capable of giving information upon oath to their lordships. I think I have now shown that, if any one has “prejudged” the case of Mrs. Deacon, or treated the Woburn guardians unfairly, it is not I that have done so; and I think that every impartial man will agree with me, that it was incumbent on those gentlemen to answer the paper circulated by the coroner’s jury in such a manner as to satisfy the neighbourhood of Woburn, and so prevent the spreading of the facts it contained, and I am quite sure that it was as much the duty of Mr. Pearse to remonstrate against Mr. Bull’s statements, published in The Morning Herald some weeks ago, when the session was not on the eve of closing all business, and, of course, all inquiries, as it is his duty now, within a few days of the prorogation of Parliament, to remonstrate against the same facts put forth to the public through the same channel. “Lady Charles Russell” above was the wife of the fourth child of the sixth Duke by his second wife! Who was Colonel Seymour? It’s a matter of some regret that the original letter from Mr Bull is not reproduced here, because, presumably, it included the list of people who might give evidence under oath. Part of this letter was reproduced on page 172 of The book of the Bastiles; or, The history of the working of the new poor law (1841) by G R W Baxter. Would the “P. Scrope” mentioned as an MP above be George Julius Poulett Scrope? He seems to have been anti-poor-law, suppressing discussion would be out of character. Yes, he’s the only Scrope MP according to They Work For You, at least at that time, and was known as “Poulett Scrope” or nicknamed “Pamphlet Scrope”. So it is rather odd that he suppresses discussion here. What was he up to? And would “Liddell” be Henry Liddell? He was way off on the right. “Freshfield” seems to be James William Freshfield, not noted for his interest in matters of the poor. Oh, what a cosy little clique! Reddall was actually appointed coroner in 1796, a position in the personal gift of the Duke of Bedford in his capacity as Lord of the Manor, and he went on doing the job for 45 years. He died on 26 January 1842, as reported in The Gentleman’s Magazine. Beds.—Jan. 26. Aged 74, Richard Ambrose Reddall, esq. for many years Clerk to the Woburn Bench of Magistrates, and Coroner for the Honor of Ampthill. Mr. Pearse, chairman of the guardians, has a lot to say here, but doesn’t mention Deacon. There were two different people called “Theed Pearse”, father and son, and it’s not clear which was chairman of the Woburn Union guardians. The dynasty is explained on page 62 of The unreformed local government system By Bryan Keith-Lucas. There are actually many more relatively well-known people with the same name, up to the present day, which is frustrating! Fielden quizzes the superintendent of the Ampthill Union on a woman called Susan Deacon at length in House of Commons papers, Volume 18, Part 2, 2 May 1838. This is a bit odd, because Eversholt was part of the Woburn Union and this Deacon lived in Flitwick, part of the Ampthill Union, and this doesn’t seem to be the same woman. The testimony is fascinating and a little horrifying for its inhumanity. It may be that this Susan Deacon is why Fielden misquotes the name in the debate above. Anne lived in Brighton, Sussex and was a housekeeper/cook until her death in 1905. George was a gunner in the royal artillery, based at Portsmouth, and later in life lived in Northamptonshire and worked as a labourer. It was a very sad time for the Deacon family as they were very well off people from the 1500s onwards, owning much property and farms in Clophill and Tingrith. Indeed, Sarah’s father in law (also Timothy) was a yeoman. They started to suffer badly after the land enclosures in the early 1800s. Much of their land was seized by the government and ended up in the hands of the Duke of Bedford. This was the beginning of the end of their wealth. There were still Deacons living in Tingrith/Flitwick at this time, and they all worked on the Duke of Bedford’s estate. This must have been a hard pill to swallow for them as they were effectively farming land which once was theirs. I have traced the Deacon family back to the 1400s who were living at that time in Sharpenhoe/Barton le Cley. (I believe the Deacon hill on Sharpenhoe Clappers was named after the family). The family then moved onto lands in Clophill and Maulden, owning farms and cottages in both villages. I have a couple of copies of wills I obtained from Bedfordshire CRO, but they are written partly in Latin and the handwriting is very difficult to make out, but I can make out some of the information. [http://www.intra-web.com/firth/examples/Family%20History.htm, and particularly http://www.intra-web.com/firth/examples/deaconsection.htm. Some of the links there are broken, I’ll try to have them fixed – EJW.] which describes how the Deacon family came to fall from grace. Andrew and I worked for a good few years searching information and he put it all together and added it to the web. I haven’t found any direct descendants of Timothy and Sarah. Son George never married neither did his sister Ann. Jane, as you know, married in Australia at age 40, it’s possible that she may have had a child though. Son Timothy, I can find no trace of so far, so it’s not very likely that there are any descendants at all, I’m afraid. It would be great to have some sort of memorial for Sarah at the Church, what turmoil she must have gone through, I wouldn’t even like to imagine, bless her. Unfortunately there were so many people in her situation at the time. One interesting fact I have found on her father, William Pennyfather is that on 23rd Oct 1823 age 69, he was sentenced to 3 months hard labour for failing to obey an order in bastardy! I lived in Eversholt when I was born, 3 Brook End, which was then 2 cottages. We then moved into a council house in Tyrells End when unfortunately my father died and we moved back to Ridgmont with my mum’s parents. Mum’s father was Bill Deacon and he worked as a gardener for the Duke of Bedford for many years.He also worked at Berrystead gardening until he was 92! On the 29th June, at Kooringa, by the Rev. Robert C. Flockart, by special licence, William, eldest son of Mr. Joseph Pearie, Penworth, Bedfordshire, to Jane, daughter of Mr. Timothy Deacon, Eversholt, Bedfordshire, England. That text was reprinted on 18 July 1859. Note, Christine says it’s wrong, and the husband’s father was Joseph Tearle of Tebworth. This partial text from the house of Lords is questioning Rev G S Bull, but the text here is very incomplete. Sorry. This is the text from the House of Lords’ papers, a copy of the coroner’s report, obtained by Robert Berkeley from the British Library. Goodness, the words are as cold as a midwinter drowning-pond. COPY OF An Inquisition taken at Isaac Pepper’s Beer-shop, Evershall, Bedfordshire, on Tuesday the 27th December 1836, upon View of the Body of Sarah Deacon. An Inquisition indented, taken at Evershall in the County of Bedford, the Twenty-seventh Day of December in the Seventh Year of the Reign of King William the Fourth, before Richard Ambrose Reddall, Coroner of our Lord the King for the Honor of Ampthill, upon View of the Body of Sarah Deacon, then and there lying dead, upon the Oaths of William Fleet, John Axome, Thomas Keene, Jonas Chance, Joseph Perry, Edward Perry, William Chance, William Braser, William Pepper, Isaac Pepper, James Large, and James Smart, good and lawful Men of the said County of Bedford, who, being sworn and charged to inquire on the Part of our said Lord the King when, where, how, and after what Manner the said Sarah Deacon came to her Death, do say, that the said Sarah Deacon, not being of sound Mind and Understanding, on the Twenty-sixth Day of the present Month of December, at the Parish of Evershall aforesaid, into a certain Pond did cast and throw herself, by means of which casting and throwing she the said Sarah Deacon in the Waters of the said Pond was then and there suffocated and drowned, of which Suffocation and Drowning she the said Sarah Deacon then and there instantly died. And so the Jurors aforesaid do say, that the said Sarah Deacon in Manner and by the Means aforesaid, not being of sound Mind and Understanding, did drown and kill herself. In witness whereof, as well the said Coroner as the said William Fleet, the Foreman of the said Jurors, on the Part of himself and the rest of his said Fellows, in their Presence, have to this Inquisition put their Hands and Seals, on the Day and Year and at the Place first above-mentioned. A true Copy. R. A. Reddall, Coroner. The Depositions were not taken in writing. R. A. Reddall, Coroner. If anyone has any information on these or any other relevant matters, please get in touch. Find the text of Fielden’s 16 July 1838 letter to the Todmorden Guardians from The Northern Star and Leeds General Advertiser for July 21 1838. Find the original text, including attached name-list, of Rev George S. Bull’s letter reporting on the affair, which may have been published in 1838. Where was Sarah Deacon living? Next door to William Brown, who married a woman with surname Meltham. Sarah lived about 300 yards from the rectory. Chapman and Pepper lived nearby. The 1841 census doesn’t show a Brown in Hills End, although it does show Chapmans and Peppers. This is discussed at length here. Find the text of the coroner’s report printed by the House of Lords, paper 189, 1838. Done! Where was Isaac Pepper’s beer shop? The Roebuck, his pub later, was the house currently standing closest to Froxfield. Who and when did Susan Deacon marry? When was she born? What did her husband, the farmer, do? Who were her children? Found! By Christine Moore. Thanks! What became of her children? Found! By Christine Moore. Thanks! Was all this reported in the local press, that hasn’t been digitised?